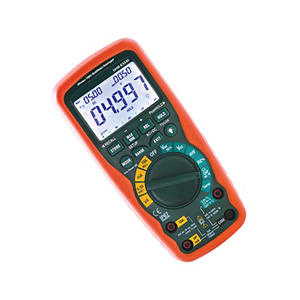 The OMEGA™ HHM-EX540 Series is a versatile wireless data logger/multimeter. In addition, it offers a diode test, large backlit LCD, auto power-off with disable feature and CAT IV-600V safety rating for industrial applications. The unit is able to data log up to 9999 readings and with the wireless USB interface has the capability to transmit readings to your PC real-time. 참고: Comes complete with double molded test leads, magnetic hanging strap, Type K bead wire temperature probe, remote receiver with USB cable, Windows® compatible software, 9V battery, hard carrying case, operator’s manual.